On November 10, Augsburg will celebrate 40 years of varsity women’s athletics and the 40th anniversary of the passage of Title IX. Lavonne (Mrs. Pete) Peterson ’50 and Joyce Pfaff ’65 will be honored at the celebration with “One of Our Own” plaques for their contributions to Augsburg College and the Athletic Department. In addition, female athletes from each decade will be recognized on All-decade Teams. Peterson, an instructor, coach, and women’s physical education director, started the Auggiettes basketball team in 1950 and coached the team for 18 years, leading them to an incredible 154-6 record. Pfaff, an Augsburg coach, instructor, and director of women’s athletics, started several women’s teams after the passage of Title IX and served the College for 43 years. Here we recognize just a few of the leaders and milestones in women’s athletics at Augsburg. 1971 – In both the floor exercise and balance beam, gymnast Ann Knutson Brovold ’74 is the first Augsburg female athlete to compete in a post-season event — an Association for Intercollegiate Athletics for Women (AIAW) Region 6 tournament. 1972 – Title IX is passed June 23, 1972. 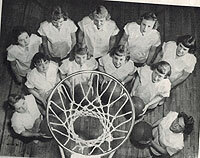 1972-73 – Women’s varsity intercollegiate volleyball, gymnastics, and tennis are founded while basketball is restarted. 1974-75 – The volleyball team places second in the Minnesota Associate for Intercollegiate Athletics for Women (MAIAW) state tournament, qualifying to compete in the Region 6 AIAW tournament both years. The Auggies place fourth in the Region 6 tournament in 1974 and fifth in 1975. 1974-75 – Softball is added as a varsity sport. 1975-76 – Women’s track and field is added as a varsity sport. 1979 – The softball team places second at the MAIAW state tournament. 1979-80 – Kathy Korum ’81 [pictured] is the first woman to play and letter on a men’s varsity team (golf). 1981-82 – The softball team qualifies for its first AIAW national tournament. 1982-83 – Augsburg joins the Minnesota Intercollegiate Athletic Conference (MIAC). 1985 – Women’s soccer is added as a varsity sport. 1988 – Under coach Paul Grauer, the women’s track and field team earns a third place National Collegiate Athletic Association (NCAA) team finish with Carolyn Ross Isaak ’89 [pictured middle] and Melanie Herrera-Storlie ’88 [right]. 1991 – Women’s cross country is reestablished as part of the varsity athletics program. 1995-96 – Augsburg established the first Midwest varsity women’s hockey team. 1999-00 – The women’s hockey team is the Division III national tournament runner-up in the American Women’s College Hockey Alliance (AWCHA). 2003-04 – Augsburg establishes the swim and dive program. 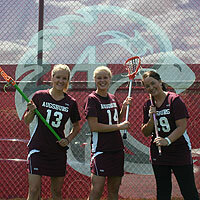 2012 – Augsburg announces that it will establish the first varsity intercollegiate women’s lacrosse program in the state of Minnesota.